The Clothesline: Have You Seen This Skunk? Have You Seen This Skunk? Recently, our household has undergone a major tragedy. Someone has gone missing. 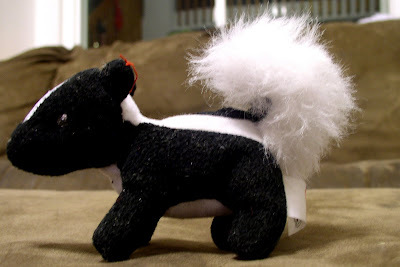 But before you start checking the news for Amber alerts, let me tell you who the victim is—a stuffed animal skunk whose name is Skunkers. Skunkers 1 and 2 became a part of our family a few months ago when we dined at McDonald’s. Ethan and James each got a Happy Meal, which also happened to be the home of a stuffed animal skunk. Of course I let them take the darling creatures home. Ethan and James named their skunks Skunkers, played with them intensely for a few hours, and then tossed them in their rooms’ stuffed animal heaps. Unfortunately, it wasn’t until Skunkers 1 went missing that I realized he how important he was to James. Their fun times came to an end when we bought our new couch. See, we not only got rid of Couchy to make room for Mr. Couch. We also got rid of a recliner, which, unbeknownst to me, was the home of James’ skunk. “What are you talking about?” I asked. “Here’s Skunkers,” I said, pointing to a stuffed skunk laying our living room carpet. “That’s Ethan’s Skunkers,” he explained. “We played a game with both skunks and I put mine in between the cushions of the recliner and now you’ve gotten rid of the recliner so now he’s gone!! !” His balled-up fists pressed against his eyes to stop the flowing tears. Over the past week, I’ve hoped James’s accusations were wrong, but Skunkers 1 has yet to appear. So now I’m putting out own version of an Amber alert, asking that if you happen to see a skunk that looks like the one in the photo, please send him our way. It will make one mommy—I mean boy—very happy. This reminds me of when my niece's beloved doll Bobbie was lost - somewhere between the mall and the car. They looked everywhere and had mall personnel involved. She finally found another Bobbie doll on ebay. So maybe ebay? Unfortunately, the only skunk I've seen recently is of the real variety and for sure you don't want one of those taking up residence! I hope Skunkers isn't truly in the chair, but maybe playing a game of hide and seek! I think the operative phrase here is - OOOPS! I wish I could help - but the last stuffed anything in our house is a Hulk Hogan Wrestling Buddy from when our big boys were little boys. Why we still have that thing is beyond me - at least we seem to have lost the green one - Million Dollar man - that thing was just gay. oh no!! one can only hope Skunkers turns up soon! any hope of retrieving the chair for just a bit to retrieve Skunkers?? Oes noes! I once made the mistake of getting rid of a doll that I thought no one played with anymore (plus, we have tons of other dolls), and three years later, I'm still hearing about it. I love the fact that they both named them the same thing! Have you checked your local Goodwill store? Ours gets tons of stuffed animals donated to it, often of the Happy Meal variety. Hope you find one soon! ACK! You never know which ones are the faves, eh? Poor kid. :( Check eBay and Craigslist. Oh there is nothing any worse than the favorite toy going missing. With 5 kids in my house something is always missing and everyone turns to me (mommy) to locate it! Oh no, I'll be on the lookout!